Carb loading is very important when running many miles in order to fuel the body pre workout and replenish afterwards. One can do this by choosing complex carbs that won’t jeopardize staying on track when it comes to meal planning. Here’s a great recipe I found for one of my favorite comfort foods. Preheat the oven to 425 degrees. Mist an 8-by-8-inch baking dish with cooking spray; set it aside. Bring a large pot of salted water to a boil. Add macaroni and cook according to package directions, drain. Meanwhile, bring onion-garlic puree, mustard, and cayenne to a simmer in a small saucepan over medium heat, stirring often. Whisk in cheddar until melted. Remove from heat and whisk in yogurt. In a medium bowl, toss the macaroni with the cheese sauce. Season with salt to taste. Pour the mixture into the prepared baking dish and sprinkle panko over the top. Top with Parmesan. 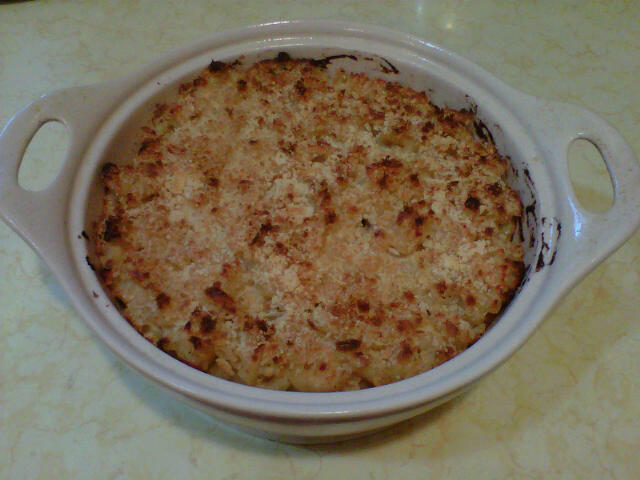 Bake until Parmesan is melted and macaroni is hot throughout, about 10 minutes. Bechamel sauce (a mixture of milk, butter, and flour) plays a starring role in traditional mac and cheese recipes. Instead use this aromatic blend of onion and garlic to build flavor and texture without fat (makes 1 cup). Combine 1 large Vidalia onion, 9 garlic cloves (roughly chopped), and 1/2 cup water in a microwave-safe bowl. Season with salt and black pepper to taste. Cover the bowl tightly with plastic wrap and microwave on high 10 minutes. The guinea pig reports: DELICIOUS!